That there is one true God revealed through scripture as a trinity of three distinct persons; the Father, the Son and the Holy Spirit. That Jesus Christ is the only Son of God and that He became a man born of a virgin through the power of the Holy Spirit and that He lived, although tempted, a sinless life here on earth. That in His great love Jesus lived, taught and died for us. He willing provided this because of our sinfulness and turning from God. In doing so He suffered, in our place, the judgment of God which we deserve, in order that we might be forgiven, be reconciled to God the creator and brought closer to Him. That Christ’s physical body was raised from death to life and was witnessed by many. That after his resurrection appeared again to others. He then ascended and returned to the Father in heaven where he reigns with Him and intercedes on behalf of all those who have believed in Him. That someday Jesus will return personally to earth as He has promised. That the Holy Spirit is at work convincing people of sin and prompting turning a person to Christ for the opportunity to experience a new life and future filled with hope. The Holy Spirit helps to change lives in pursuit of spiritual health according to God’s will. 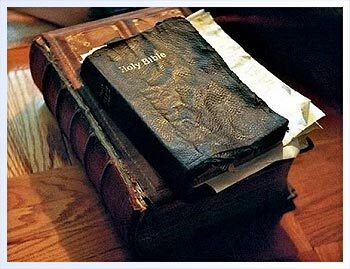 That the Holy Bible is the inspired word of God and is the only complete authority in all matters of faith and doctrine. That sin entered the world when the first man and women, whom He created, chose to sinfully disobey God and please themselves. This caused a spiritual death and separation from God. Since then sin has affected the core of all humanity, touching every part of our nature and being. That it is only by God’s grace and mercy that the sinful person finds forgiveness and is brought back into a rightful relationship with God through faith in Jesus Christ alone. That God designed the soul of a person for His eternal purpose. Those who have refused to believe will eventually be condemned from God’s presence forever. Those who have believed and have been forgiven will be raised and together will be taken to live with Him forever. That all Christians have an obligation to demonstrate their true allegiance to Christ by determining to purposefully live their lives in gratitude to please Him and as a result willingly serve others. As a manner of operational policy, the CPA-USA believes the ministry of the Holy Spirit, in the life of the believer, is to glorify Jesus Christ in and through that life. The CPA-USA is interdenominational and does not teach, promote or practice any interpretations of the gifts of the Holy Spirit or any major doctrinal issues which have historically acted to bring disunity and division. CPA-USA does not ask officers to change their personal beliefs, but simply to recognize this established policy for the order, harmony and good of all.